RancherMan & I are slowly learning what veteran chicken-raisers have known all along about raising chickens and about fresh free-range eggs. Last year we raised our very first batch of chickens from day-old chicks. It was lots of fun seeing them turn from fuzzy peepers to a full grown egg-producing chicken. Although there’s no difference in taste or nutrition whether white shell or colored shell, I was very surprised to learn that the color of the shell was dictated by the color of the chicken’s ear lobe. I’ll admit I didn’t even know chickens HAD ear lobes! 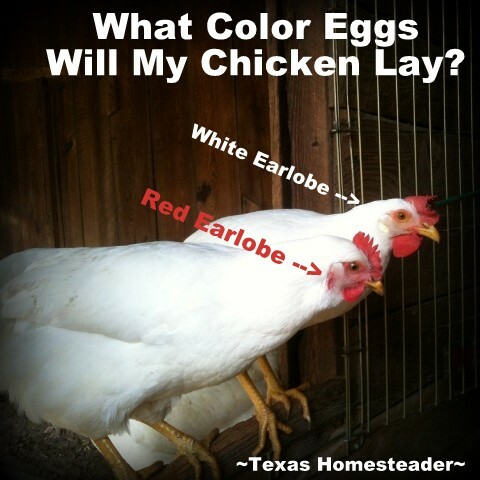 Chickens with white lobes usually produce white eggs and chickens with red lobes usually produce brown eggs. Note in the picture above that I have 2 brown eggs and one white. Sure enough, we had three Ideal 236 chickens, two with red lobes and one with white. Fascinating! Free-range eggs are actually much more healthy than their commercial counterparts according to an article in Mother Earth News. The article stated that pastured poultry lay more nutritious eggs which contain 1/3 less cholesterol and 1/4 less saturated fat. Not only that but they also contain much more of the good stuff like 2/3 more vitamin A, twice as much omega 3 fatty acids, 3x the vitamin E, a whopping 7 times more beta carotene and 4-6 times more vitamin D! Wow. 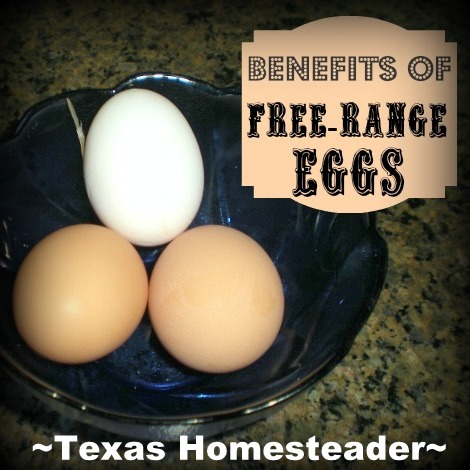 Free-range eggs look and taste distinctively different than store-bought eggs. Can you tell which is which in the picture below? Free-range eggs have a much darker yolk, it’s said that’s due to their healthier natural diet that includes plenty of greens and the protein of bugs. And the taste of a free-range egg vs a store-bought egg is comparable to the taste of a garden tomato vs a store-bought tomato. ‘Nuff said! After the chicken lays the egg its shell is protected by a coating of an invisible substance called ‘bloom’. This magical protection seals the egg from outside bacteria, but any moisture will remove it. For this reason it’s helpful to keep the nesting box clean of any droppings so the egg will stay clean. But even if there is a spot of mud or droppings on the egg when I retrieve it, I’ll only wipe it with a dry cloth when I bring it into the house. Any washing of the egg will have to hold off until I’m actually ready to use it. It’s said that store-bought eggs MUST be kept refrigerated because the commercial eggs have been washed, therefore removing the bloom. But free-range eggs don’t even have to be refrigerated as long as you don’t wash them. Although I still put my eggs in the refrigerator because I just can’t wrap my head around this idea, there are many that say free-range eggs will stay fresh for weeks without refrigeration because of the bloom. Supposedly in many countries fresh eggs are never refrigerated. When the chicken lays the egg it goes into a state of suspended animation as she lays a new egg in her nest every day. After several days the hen goes broody & sits on the eggs and all fertilized eggs will then proceed to grow into baby chicks. Because we remove the eggs each day there’s no opportunity for an accumulation of eggs but it’s fascinating how nature works! We enjoyed our chickens so much last year that we decided to raise chickens again this year. We bought young pullets and are already seeing the first small eggs coming from them. I’ll keep RancherMan supplied in egg salad for sandwiches and of course we’ll offer to bring the deviled eggs to any luncheon we’re invited to. I’ll also begin freezing the eggs again to preserve the overage, and if they produce well enough I’d really like to find a market to sell my extra eggs. I have no idea how to even begin selling eggs – any veterans out there that could offer advice? 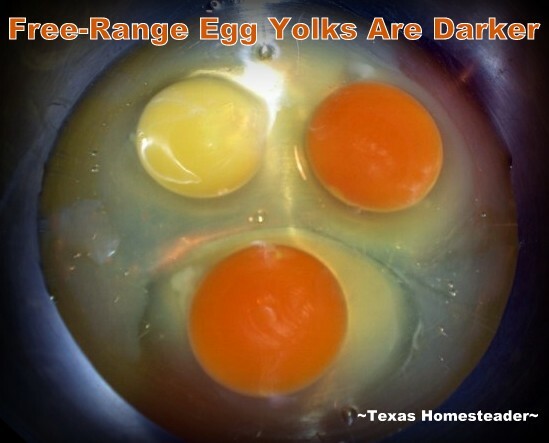 This entry was posted in Blog Posts and tagged Chickens, Cooking, Frugality on April 8, 2014 by Texas Homesteader. Pingback: Do HOA's Hamper Voluntary Simplicity? I wish I lived near enough to you to only pay $3 a dozen for free range, local eggs! Around here, it’s $5 per dozen!! I soooooo want chickens of my own. I’m working on it! Thanks for answering my question. Aren’t pullet eggs smaller and how long does it take for them to begin laying large eggs? Why don’t you keep your chickens during the colder months? Is it just an upkeep thing? Do you have a hen house or do they just really roam free and fend for themselves? The chickens in Key West are truly free range as in they have no owners, they are feral like the 6 toed cats that also roam the island. Stick a sign out front and people will stop. Around here, many of the casual sellers sell their eggs for $2.00 a dozen. I’ve bought from four or five different places that sell for that. Anyplace that has gone so far as to pay to be certified organic, and free range, sells them for $6.00 a dozen. Farmers markets sell anywhere in that range of two to six dollars a dozen. Congratulations, good luck and have a blessed weekend! I agree with everything said about selling and refrigerating eggs. While I have been to your blog many times just want to let you know I followed you here from the Homeacre hop. When I first met my husband he had chickens that had belonged to his ex father-in-law. My husband had raised these chickens for years. About a year after I moved in, the ex FIL took the chickens away and sold them. I was sad because I felt these wonderful pets we had grown to love and cherish were just being sold for food and no longer going to be used to lay eggs. I know, that is how it goes sometimes. I was also sad to have my unlimited egg supply go bye-bye. I’m looking forward to the day we find a home of our own (sell this one) complete with chickens. This is really a very nice summary, TMR. I found it via From the Farm blog hop. I will share this one on my FB page, because it is extremely useful info for people considering chickens. Thanks! Thank you for your info thinking about getting our own chickens. How do you freeze eggs? When our daughter and SIL lived in China they picked out their eggs from a huge piled display at the store and put them into plastic bags just like you would produce! They never refrigerated their eggs over there because their fridge was tiny and the space had to be saved for other foods. They just put them in a basket on the counter. Wonderful info… How do you freeze eggs? We get our eggs direct from the farmer and we don’t refrigerate them. They are SO much tastier than any storebought eggs, even more than eggs I’ve gotten from other farmers. We scored big time with this one! Enjoy! I agree with Mary, tell friends and relatives that you have extra eggs available for sale. We don’t even have our chickens back yet and I already know I will be able to sell the extras for friends, family, and my wife’s co-workers. Have fun. To sell your eggs, just let people know you have them available. If anyone doubts the benefits of fresh eggs, maybe give them the first dozen free. Also be sure to ask them to save and return the egg cartons. In my experience, you won’t have any problem is finding buyers.